New York City FC is pleased to announce that goalkeeper Josh Saunders has signed a new multi-year contract extension. Saunders started 33 games for the Club this season and recorded four clean sheets in New York City’s inaugural campaign. Per Club and League policy, terms of the deal were not disclosed. Speaking to NYCFC.com, one thing Saunders said he treasures most is the relationship and connection that he has with New York City FC’s fans. 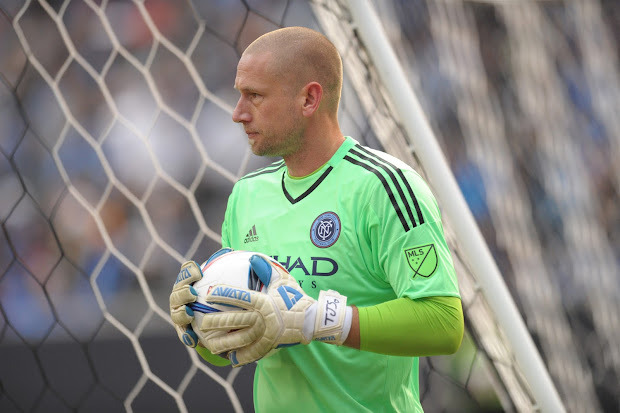 Saunders, who led Major League Soccer with 124 saves and was named New York City FC Defensive Player of the Year, credits goalkeeping coach Rob Vartughian for helping him to a successful first season in New York. Echoing those comments, incoming Head Coach, Patrick Vieira, is thrilled about the extension. Josh Saunders was nominated for Major League Soccer’s “Save of the Week” 11 times during the 2015 season and won New York City FC’s Etihad Airways Player of the Month on three separate occasions (March, April and October). "Per Club and League policy, terms of the deal were not disclosed." How I hate that phrase. I'm glad to see this, though. He kept us in many games, especially some of those early ones. And without a whole lot of help in the back.